NaviKey is a tool for querying descriptive data. Learn more about NaviKey on http://www.navikey.net . DiversityDescriptions (see Databases for further information). Character panel: selection of the characters. Character states or numeric data panel: preselection of states of the selected character (to finalize the query, the <Select> button is to be used). Query criteria panel: display of previous character state selections. Matching items panel: display of matching items (selecting any item will bring up a complete description of that item). When checked, controlling character states make dependent characters - as defined in the database - inapplicable. When checked, NaviKey selects those items matching by at least one character state of the selected characters, otherwise only those items matching directly the selected combination of character states. 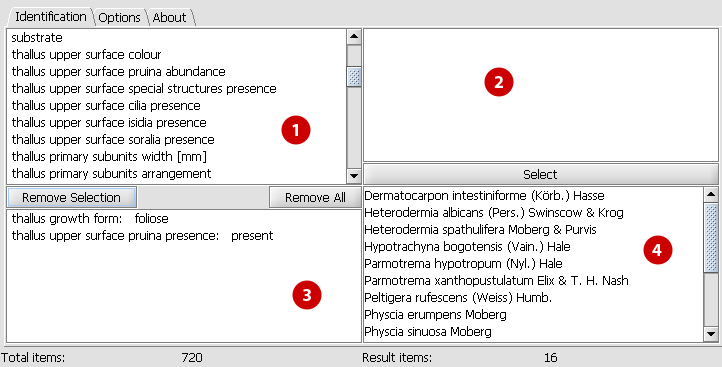 When checked, the whole range between the extreme values (if present in the item data set) is used in numerical queries, otherwise only the range between minimum and maximum values (if present in the item data set) is considered. When checked, overlapping between queried and the specified numerical intervals is matching, otherwise not. This page (revision-1) last changed on 17:05 14-Feb-2007 by unknown.